This is my first finish for 2010! This isn’t a quilt, but I am counting it as a finish anyway. 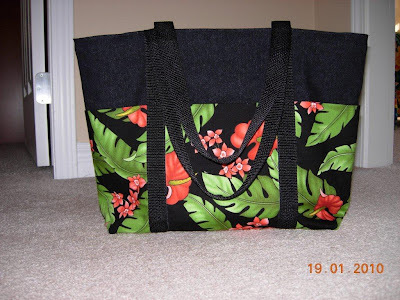 This bag was made a week ago as an early birthday present for my mom. I have made these bags before, but this is the first time I have made one with a zipper top. The base of the bag is denim and the straps are webbing–going all the way down the side of the bag. The materials used make this a sturdy bag that will withstand heavy items such as books. Bags are great gifts. Well done for finish # 1. It’s beautiful. Did you use a pattern or just wing it? I understand that big bags are all the style these days so your mother will be very fashionable. Definitely a finish! A beautiful one that I am sure Mom will just love. Congrats on your first finish! Happy Birthday Mom! WOOHOO! A finish but I know you are close to another cross off soon. This turned out very pretty and sturdy. Perfect for your Mom’s upcoming trip. I like it, I like it!!! Gorgeous finish!